How to Stop Overthinking | Go From Stress To Success! Overthinking is a really common problem in high school and college! Part of the reason is that tests are usually high-stress situations, and big assignments often “count” for a lot of your grade. It’s no wonder that your brain immediately begins double-checking everything! 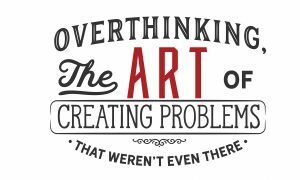 Let’s talk about what overthinking is, when it usually shows up (and why), and how to stop overthinking. Overthinking is an expression of anxiety. The test feels like a big deal, and your body responds. Your heart rate speeds up. Your muscles tense up. Maybe you start breathing more quickly, or you get lightheaded. All of these physical symptoms are the kinds of symptoms that we evolved to have when we saw a threat that could kill us, back before we were civilized and living in cities. You see a lion, and your body gets ready to do one of four things: fight, flee, freeze, or fawn (although fawning may be a specific reaction we developed once we lived in large groups). Back when we ran into lions on the regular, these physical symptoms helped us get ready to fight, run, or hide from the lions. These reactions kept us alive. 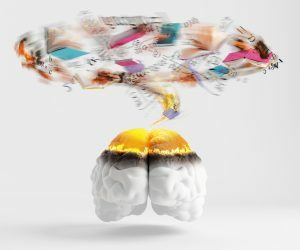 Essentially, anxiety signals your lower brain – the non-thinking, purely reacting brain – to say “hey, we’re in danger!” Then your lower brain reacts to the anxiety by putting us at the ready to fight, flee or freeze, and our upper brain – the thinking, reasoning brain – starts searching for a solution. But the fact is, an exam doesn’t put you in danger. Neither does a big assignment. But it feels like it does! And what does your brain do? It puts you in an elevated, alerted physical state. Adrenaline starts pumping and you get really, really hyper-aware of your surroundings. So let’s start out by saying this: Your brain – both the lower and the upper – is a liar. Your brain developed to protect you from threats. But the threats we face these days aren’t tigers and lions. They’re more like a bad grade, or a failed class, or damage to our reputation, or disappointing our parents. None of these will kill you, but your brain thinks these are top-level emergencies! The part of your brain that reacts to your tension about something that’s going to be demanding, like an exam or a big project, can’t tell the difference between an exam and a lion. It thinks that you’re under attack and you’re going to die, because it’s not good at nuance. Physical stress –> I’m under threat –> I’m going to die –> I have to fight, run away, become invisible, or make the threat happy so I won’t die (fight, flight, freeze, or fawn). But the facts are, you’re not under threat and you’re not going to die. Most of what your lower brain thinks you need is not relevant anymore. And if your upper brain is getting in on the action, it’s acting on faulty information. What do we call an alarm based on faulty information? So how do we turn off the alarm bells? Now, it’s totally possible to be more than one kind of overthinker, but most people tend towards one or two of these – it’s where they are the most challenged. So read on for how to stop overthinking, no matter what kind of overthinker you are! 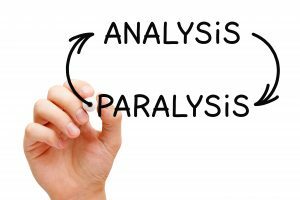 Analysis paralysis means that you’re getting stuck on a particular point and unable to move forward. This happens a lot on exams with essay questions, multiple-choice questions that have longer answers, and even regular multiple-choice questions on exams. It can also happen when you can’t seem to move forward on a paper or project, because you can’t figure out where to start. To combat analysis paralysis on an exam, set a time limit: you can brainstorm on an essay question for two to five minutes, but no longer. The exact number of minutes depends on how much time you have for the whole exam. Try to keep it to no more than 5 percent of the available time. Once that time is up, you must begin to write. To deal with analysis paralysis in multiple-choice questions, go with your gut. Read the question once, and pick what seems like the right answer to you. 90% of the time, you know it – but you’re used to second-guessing yourself. Don’t do that. If you absolutely can’t stop second-guessing yourself, set a limit on that, too. If you know that you’ve studied the material in several different ways, and quizzed yourself before the exam and done okay on the self-quizzes, then trust your gut most of the time. You can second guess only one time for every 25 questions you have. To counteract analysis paralysis on a paper or project, set a time limit: You get one day to brainstorm, but then you have to pick a way forward and go with it. It’s probably no surprise that Finishers and Fence-Sitters often end up in analysis paralysis. Finishers do it because they keep seeing more things they need to do before they can consider the question done. Fence-Sitters, on the other hand, do it because moving forward means making a decision. As long as they keep analyzing, they don’t have to do that. Ah, this is where you overthink by trying to figure out exactly what the question is asking, and trying to make sure you haven’t missed anything. This leads to reading, re-reading, and re-re-reading a question and still not being sure if you understand it. To stop being a detective, you’ll have to limit yourself to one read-through of any question on an exam (no matter what kind of question it is! ), and no more than three readings of the instructions for an assignment. After that, you must start working on it. Perfectionists and Finishers are the main victims of this kind of overthinking. Perfectionists do it because they’re scared of being, well, less than perfect. Finishers do it because they don’t want to leave anything overlooked, unanswered, or unfinished. 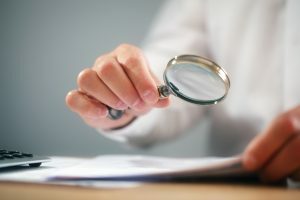 There are some additional strategies for these two groups when it comes to detective work. For both groups, embrace imperfect action and the concept of “good enough.” Perfectionists, remember a finished exam, paper, or project that isn’t perfect is better than one you didn’t finish because you were obsessing over making it perfect. Finishers, remember that if you’re trying to make sure you have every part of every answer, you may finish some of it, but you won’t finish all of it. Focus on finishing the exam or assignment. The never-ending brainstorm is when you can’t stop thinking about new ideas. You think, “Maybe this will be a good way to do this assignment,” but by the time you’ve gather your materials or research, you’ve thought of three other ways to approach it that seem just as good. You get overwhelmed by all these ideas, and as a result, you freeze instead of moving forward. The group most likely to end up in a never-ending brainstorm are the Fence-Sitters, and that shouldn’t be a surprise. Making a decision for Fence-Sitters feels agonizing. There’s so many possibilities! But the problem is, they hide behind the possibilities and never make a move on the assignment. If you recognize yourself as a person who has never-ending brainstorms, it’s time to force yourself to make some decisions. First, set a time limit on your brainstorming. You can have one day to brainstorm for your project, but that’s it. After that, you must pick one path and move forward on it. If you have more than two possibilities, do eeny-meeny-miney-moe to pick the one you’re going to use. (Yes, I’m serious.) Whichever one you end up on is the one you go with. Another option is to write the name of each possibility on a slip of paper. Put them in a hat. Ask your roommate, brother, friend, or partner to pick one slip of paper from the hat. There’s your choice! In all cases, reassure yourself that you’ve generated a bunch of ideas – and even though you’re not using them now, you’re going to keep them in an “idea file” that you can come back to when you need a topic for another project or paper. Finally, there’s dithering. Dithering is when you keep playing the possibilities you have, or the mistakes you’ve made, over and over in your head – and when you do that, you lock up. You can’t move forward because either there’s too many options, or you are stuck on how you’ve messed up in the past and you want to avoid that situation in the future. The two groups here are Fence-Sitters and Ruminators. We’ve already addressed how Fence-Sitters can get out of this downward spiral – it’s the same thing you do for a never ending brainstorm. But Ruminators need some help taking their mind off the path of All The Ways I’ve Screwed Up and moving to the path of What I Can Do Now. For Ruminators, here’s a few options. Write down all of the things you’re turning over and over in your head, so you can get them out of your head and onto a page, where you can see them. This will help you realize that they’re probably not as bad as you thought, and that you don’t have to carry them around in your head now, because they’re on the page. Remember to embrace imperfect action and imperfect results. Remember that a finished exam or project is better than one that’s not. Finally, Ruminators are likely to get anxious about changing the way they’ve always done things. 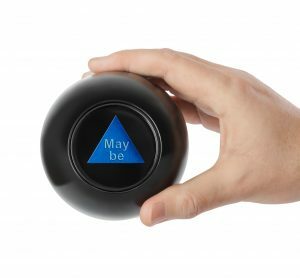 So if you’re facing anxiety about not ruminating, ask yourself this: Will this thing you’re turning over and over in your mind matter in five minutes? How about five days? How about five months? Will it still matter in five years? This will help you get some perspective on the problems you’re obsessing over, and realize that most of them aren’t worth that much time, energy, effort, and stress. Although the solutions listed above tend to work better for certain groups, here’s a few other ways to deal with overthinking that work pretty well for everyone. If you’re overthinking on an assignment, and the overthinking presents itself as “I don’t know how to do this!” then the first step is to read the directions slowly and carefully. Don’t allow yourself to “read into” the directions. Read them word-for-word. Identify any place that doesn’t seem clear – write it down. Then take that unclear place to the professor and ask them for clarification. Finally, remember that mistakes are a necessary part of learning. If you make no mistakes, you didn’t learn anything. This will be really hard for Perfectionists and Ruminators, especially – but it can be done. Whether you’re a Ruminator, a Perfectionist, a Fence-Sitter or a Finisher, there are ways to stop overthinking. It may seem strange at first, but allowing yourself to embrace imperfect action, set time limits on how long you can overthink, and limit your second-guessing can go a long way to eliminating your brain’s false alarms. Posted in Best Practices, Mistakes, Tests and Exams.